Most of us, when we think of IT, think about computers and servers, networks and the internet, hardware and software—and we’d be right. However, managing your IT is so much more than these pieces. It’s really about people. The people with the skills and expertise in infrastructure and applications both onsite and the cloud, monitoring and preventative maintenance, physical and system security, backups and restores, business phones, procurement, issue support, and the list goes on. That’s why you need a team of experts to help you manage your IT. People who can recommend the right combination of hardware, software, and services to fit the needs of your company. 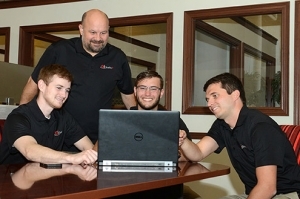 A team who not only install computer equipment and make it work but order it with the correct specifications to seamlessly fit in your environment from the start. Technicians and IT Specialists that are available whenever you need them for keeping your business network up and running. Advisors who monitor the hardware and software on which your business depends, and prepare you for system obsolescence and support end-of-life. QualityIP has the people you need to manage your IT. QualityIP Knows IT, and we’re there when you need us!